Newcastle Libraries has posted a cache of UK historical images, like the fishing photos above, to Flickr. Pictured above: At left, a studio portrait of a Fisherman from Cullercoats taken c.1890. The man is wearing a waterproof coat souwester and cork life-jacket. 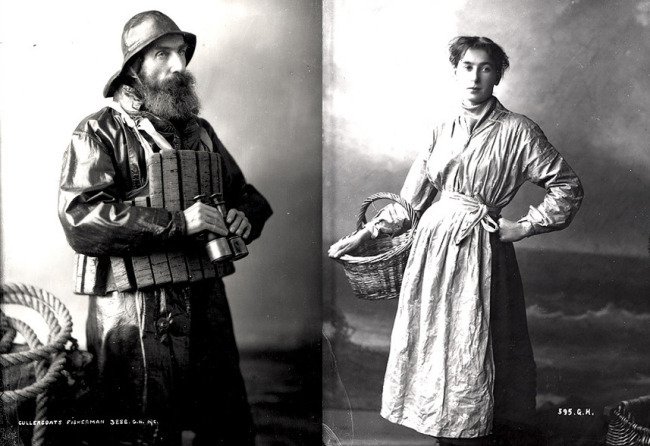 At right, an 1897 studio portrait of Maggie Brown a Fishwife from Cullercoats. Maggie Brown is wearing her 'best' clothes which include a printed cotton or silk blouse with matching apron. A silk square is worn to fill the neckline of her blouse. Drink trends: beet cocktails like the Beet Me in St. Louis with beet-infused gin, honey and tarragon, and growing US enthusiasm for port, especially aged tawnies. The romance version of farming spreads further into pop culture with a boom in farm-lit. "Thanks to the economy, picket fences and scruffy farm hands have replaced stilettos and cute i-bankers in literature aimed at women....And in this era of Brooklyn backyard chickens, farmer's markets-as-social events, Anthropologie aprons and hipsters baking homemade bread, what's more aspirational than running away to a farm?" Breaking News from Financial Times summit: rich people still super rich, keep trying to sell them expensive stuff "The good news is that the people who buy the products you make are doing much better than everyone else by a very big margin and nothing in the crisis has changed that,” said Martin Wolf, chief economics commentator on the Financial Times. When trademark law goes bad: First Chick-fil-a sued those nice Vermont kale enthusiasts, now the Economic Development Department of the State of New York is suing a New York coffee shop over a riff on it's I ♥ NY logo. Apparently, local pride is going to cost you. We've all been hearing about colony collapse disorder and the crisis of dying bees. In China now it’s gotten so bad they are hand-pollinating blossoms in orchards. A new film called More Than Honey explores the issue (click for trailer). Food waste — one of the most persistent issues in our ability to feed the world and husband resources. Worldwide, nearly one quarter of all calories produced are going uneaten (infographic), either from spoilage at production on later. One San Francisco-area teen has taken matters into his own hands and founded the tech platform Waste No Food, which help restaurants make timely donations of their surplus food. Leading area restaurants like Manresa have joined in.